Isn't this just adorable? I love a good movie-themed marriage or prom proposal. One of our regular readers, Mike Eisenberg, a creative director at up-and-coming film company Tall Tale Productions, just proposed to his fiance Kailey, a lead producer at the same company. 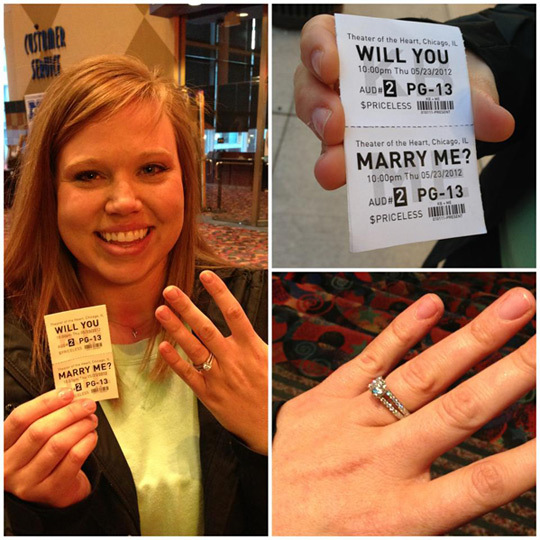 The way he proposed was by taking her to their local cinema and having them print up a special ticket on their own ticket stock that said "Will You Marry Me?" as the title and info instead of an actual movie title. Aww. He posted a few photos online and I asked his permission to repost them, as a bit of charming cinematic romance leading into this holiday weekend. Mike tells the story: "I wanted to do something that made sense to our relationship. We love movies. It is the foundation for the whole relationship. So I designed a fake movie ticket and called the theater we usually go to (Century Evanston 12) to see if they could print the design on their ticket stock. They were pretty into the idea and helped out without question… We arrived and I gave them my name. They gave me an envelope and my girlfriend was a little confused why it was happening this way, so I asked her to double check the tickets. 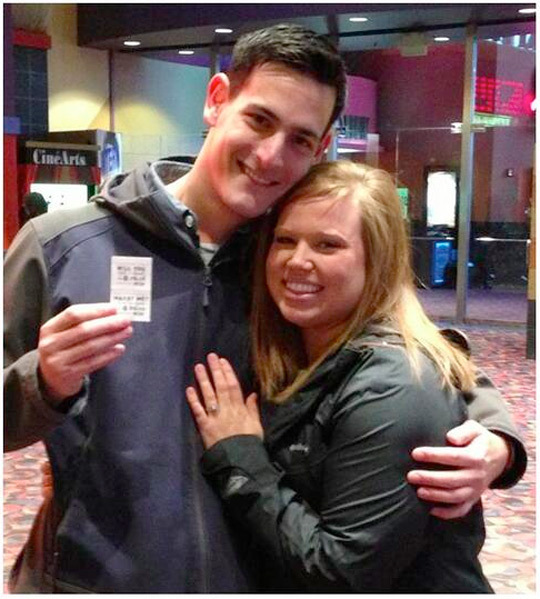 It took her quite a whole (relatively) to realize the tickets were not real and in fact said Will You Marry Me? and then gave the appropriate happy freakout and I dropped to my knee and she said yes." Cute? A marriage with no full frontal. So sad. Should have gone for the NC-17.